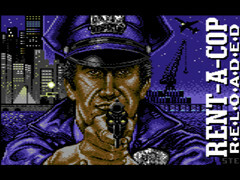 Rent-A-Cop Reloaded is a new game for the Commodore C64. The game is made by Achim (code & graphics), STE'86 (graphics) and Goto80 (music). The game was released at Mayday! Air Base Conference II.